Our urban garden bench is a great addition to any new or maturing garden. The corten ‘finish’ offers a modern stylish twist and this industrial (rust) look is often used in garden design. The soft natural tones of the bench finish are striking but also complement the green hues in garden planting. Bench top and feet are solid wood – choose from oak, sapele or teak. Alternative wood choice also available on request. Comes wax or oil finished. The bench base legs are steel box section made. And available in a choice of finish including corten, polished stainless steel or metal finish in bronze brass and copper. Dust regularly and only if necessary wipe clean with a damp cloth, buff after with a dry cloth. Avoid placing sharp objects directly on the wooden top to prevent scratches. Wax or re-oil regularly. As with all wood products, slight variants in colour and tone should be expected due to the nature of the material. Wood, especially when used outdoors, is susceptible to changes in the temperature and atmosphere, weathering (including movement) should also be expected. 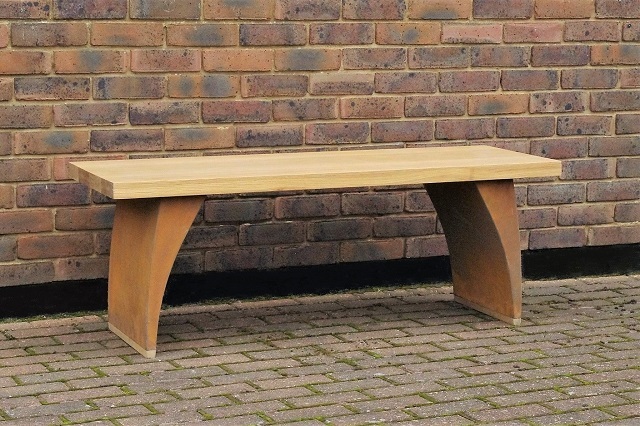 Our urban garden bench with its simplicity is a perfect bench for a modern garden. 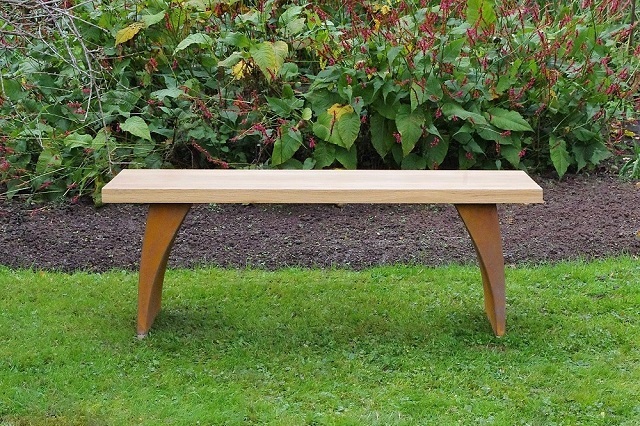 With a clean and bold silhouette this unfussy modern garden bench will bring warmth to any patio and seating area. Bench top and feet are solid wood with a standard choose of oak or sapele. Teak is also available at a premium and other wood choices are available on request. We will either wax or oil the wood accordingly. Bench base is made from steel box-section and is available in a choice of corten rust finish, mirror polished stainless steel or metal finish in bronze, brass or copper.